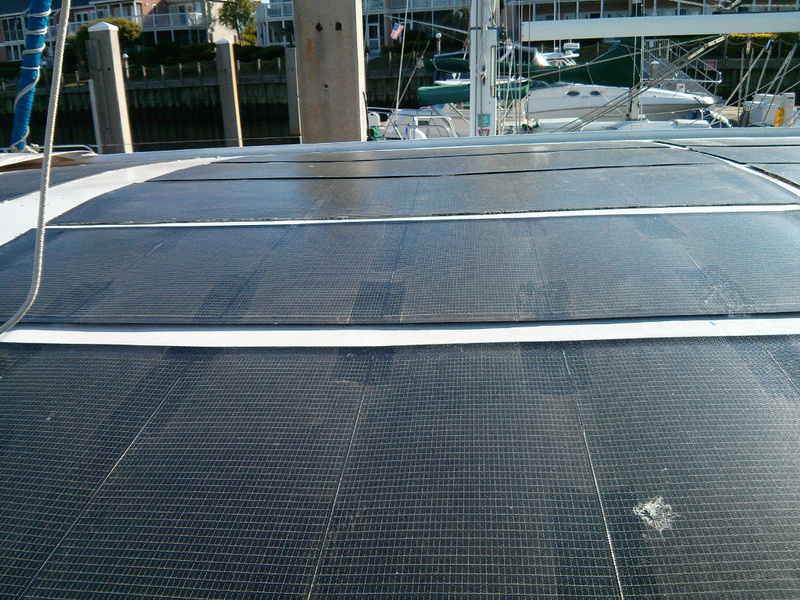 So I reached a mile marker in the solar panel installation saga. 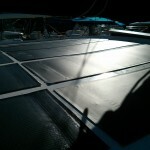 The solar panels have been glued down to the dodger and all the wiring under the dodger completed. 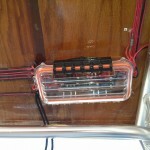 Another shot of wires penetrating the dodger and running to the junction box. 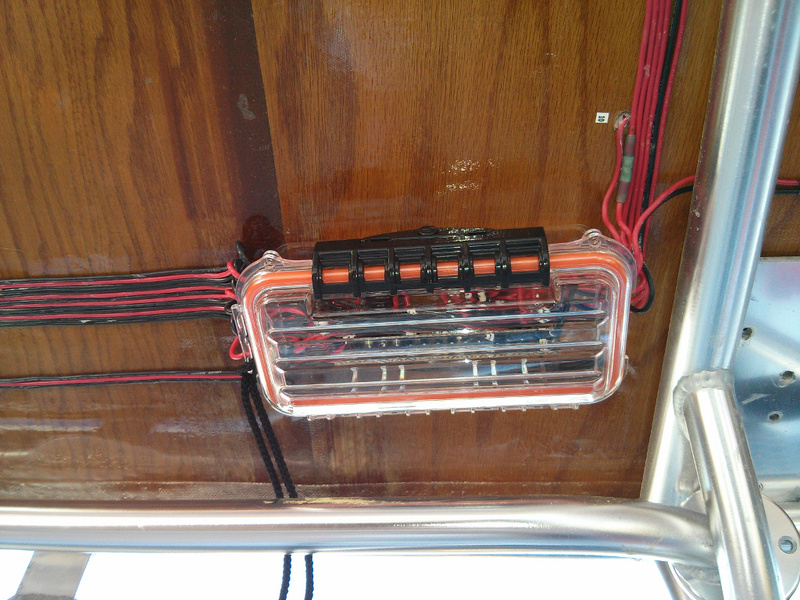 The wiring is Marine Grade 16 gauge tinned copper wire. I solderd 12 inch lengths of wire to each positive and negative terminal on the panels and then led the wires through pre-drilled holes in the top of the dodger when I glued the panels down. 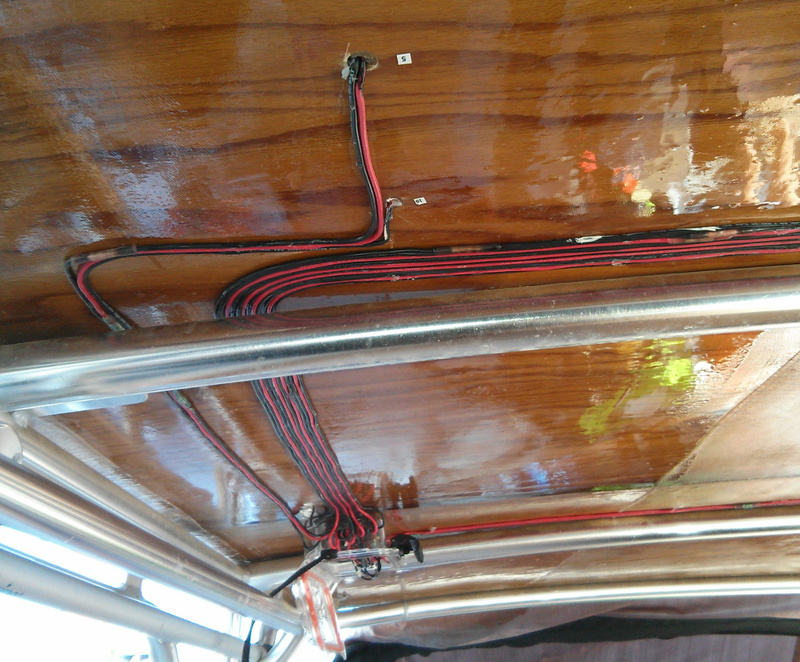 The 12 inch wires were then connected to the full length of 16 gauge wire wire that runs to the junction box for all 13 solar panels on the dodger. 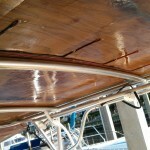 The wires were glued to the underside of the dodger using profeshional grade superglue. 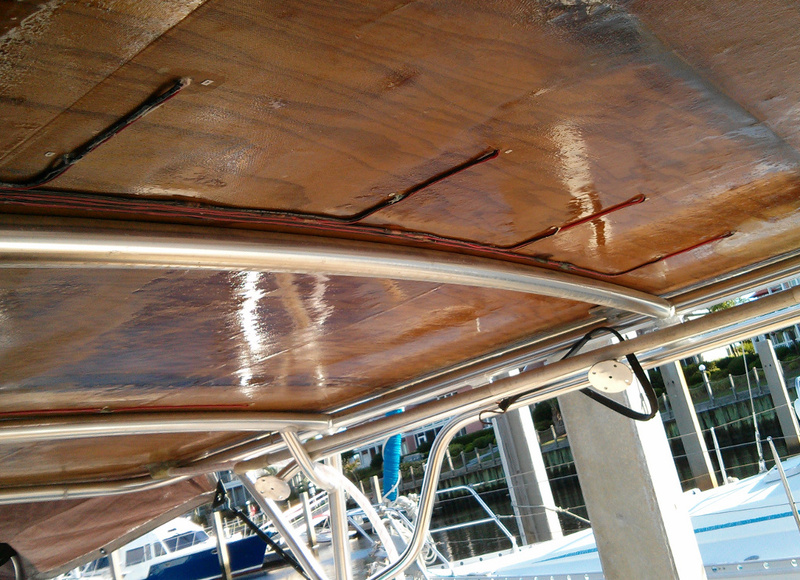 Later they will be painter over with epoxy and then paint when the underside of the dodger is painted white. 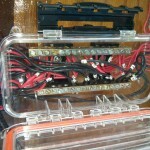 All panels are labeled beside the penetration point and at the wires as they are connected to the positive and negative buss bars in the junction box. You can see the two bus bars and all the individual positive and negative leads connected. Also note the electrical labels that tell what panel each set of wires is conneted to. 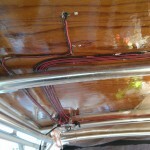 If you look closely you can see that both buss bars had di-electric grease applied to them as well as the ends of each wire being dipped in it and solidly covered before being connected to the buss bar. After everything is finished silicone will be applied around the wires where they penetrate individual holes drilled in the end of the junction box. 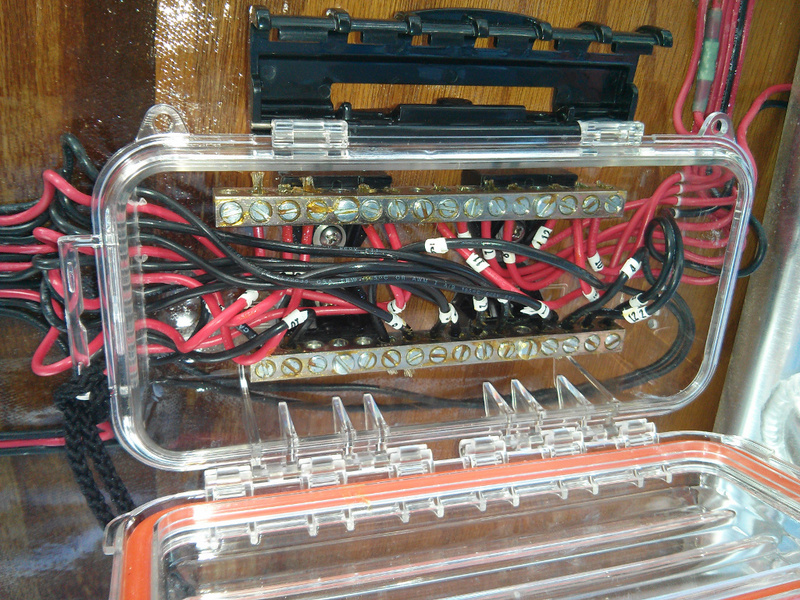 This the the closed junction box. You can see the wiring running into both ends of it. I currled the wiring up a little to create a drip loop in each one. The box is a polycarbonate cellphone/camera/paperwork case that has a o-ring seal as well as locking tabs. Once I close this up I will put some bags of desicant in it and latch and then lock it so that people can’t accedently get into it. 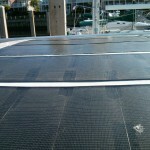 These are each 25 watt thin film solar panels made by acompany called Ascent Solar. 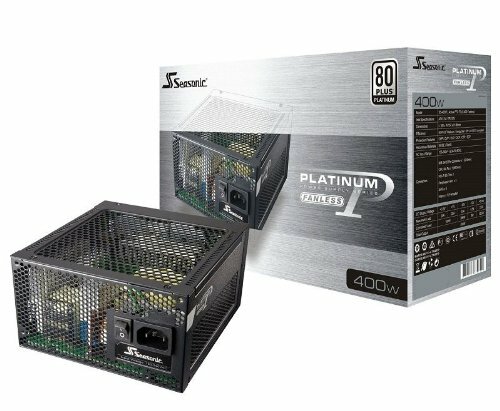 The put out a nominal 1.74 amps at 24 volts each. 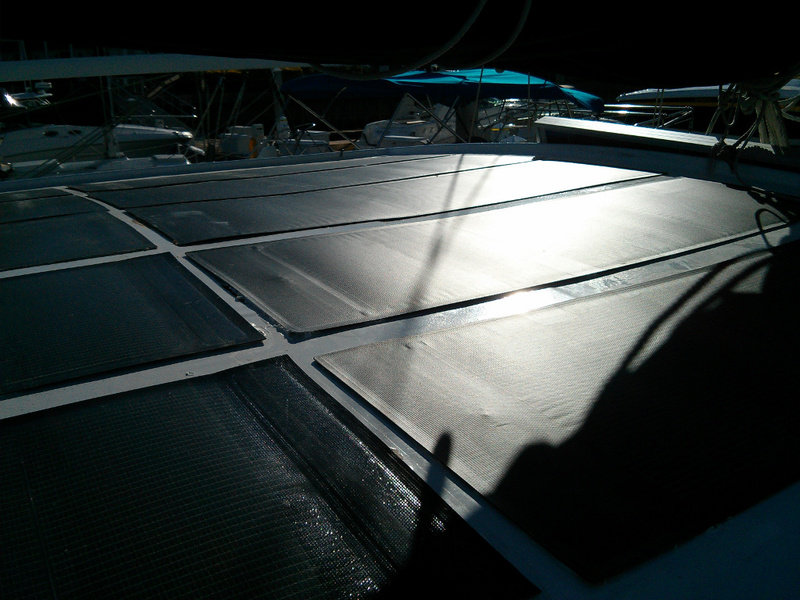 After wiring everything in today I tested the junction box buss bars at 6pm with the sun low in the sky and as you can see significant amounts of pollen on the panels. I was still generating 20 volts and 6 amps of current. Under summer sun at noon directly overhead I should generate 24 volts at 13 amps or 26 amps at 12 volts once the MPPT charge controller gets done converting it.